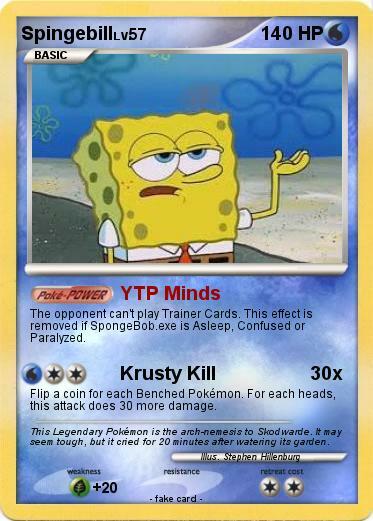 The opponent can't play Trainer Cards. This effect is removed if SpongeBob.exe is Asleep, Confused or Paralyzed. Flip a coin for each Benched Pokémon. For each heads, this attack does 30 more damage. Comments : This Legendary Pokémon is the arch-nemesis to Skodwarde. It may seem tough, but it cried for 20 minutes after watering its garden.